Nice going, is that legal? Funny how this topic gets ignored by the republican party supporters on these boards. What's up South, Mike? Are you still figuring out how to blame the "liberals" for this? Is the source not credible? Yeah, like they never made as much noise about Diebolt as they are doing with ACORN. I voted Republican. We're not all corrupted you know. Both Democrats and Republicans have good and bad people in them. As with all organizations and political parties. No, the source is not credible. Politicians of one party create "reports" all the time, the purpose of which is to embarrass members of the opposite party. It's just the way politics works here in the U.S.
Are you claiming that this report is a lie? And a second question, did you bother to read it, I know it are a couple of pdf files, but I read it and it's very wel documented and accompanied with facts. I think that it is very likely that all, some, or most of it is untrue. Like I said, politicians do this type of thing all the time in an effort to gain political points. Do you have a way of verifying the "facts?" Believe me, when politicians are involved, what they call "facts" are subject to interpretation. I love how you tell us you are not pro-Obama, Ferre. For someone not pro Obama and fair and balanced as you would like us to see you, you are trying pretty hard to find whatever you can on McCain. Would you mind linking us to a thread you've started exposing Dems for anything? I do that on purpose Mike, simple because the past weeks there were numerous topics posted with the only purpose to smear Obama, if there had been numerous topics smearing McCain I would have posted some stuff on Obama, there was no balance anymore, it looked like this board was populated with right wingers, all I do is add some balance because I found it needed. This report has nothing to do with McCain. It has to do with the White House, which, the last time I looked, was occupied by one George W. Bush, not John McCain. Obama supporters will always find an imaginary bridge to link any scandal or rumor to John McCain. It never fails. They will also do everything they can to link McCain to Bush, which, of course is completely inaccurate. McCain was always the Republican who fought the most against Bush. They point to his voting "with Bush" (whatever that means since Bush doesn't vote) 90% of the time, but a Senator who votes against an incumbent President of his own party 10% of the time is truly a maverick ( I know, an overused term). Also, keep in mind that many votes are not heavily contested and are bipartisan ratifications of things everybody agrees on. I'm sure Obama voted with Bush many times. I'm sure Obama voted with Bush many times. Here you go slandering the Messaiah again. Is that video supposed to prove something that hasn't already been said here? McCain stating that he voted with Bush 90% of the time. So what? Or it could be Bush + 10%. 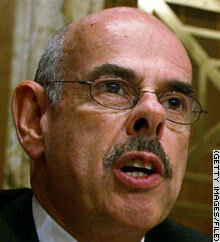 I distrust this report because of the character of Waxman. Though he is clearly the father of the National Enquirers bat boy, he has never stepped forward and taken financial or parental responsibility. I think my point is made clear.